The crowd offered to save his life if he would join the Calvinists. Fidelis replied: "I am sent to root out heresy, not to embrace it. 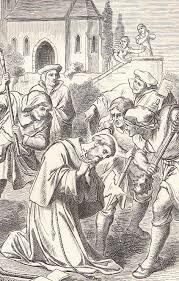 The image shows St Fidelis being confronted by Calvinists offering him safety if he would join their Church. His reply was: “I am sent to root out heresy, not to embrace it. The Catholic religion is the faith of all ages, I do not fear death.” Born Mark Rey, he was a well-educated young man who developed a burning zeal to live and preach the true gospel. He was martyred as he tried to win back Calvinists and Zwinglians to the Catholic faith in Switzerland. Patrick Duffy writes his story. Born in Sigmaringen, a town in the Danube Valley, in the State of Baden-Wuttenberg in south west Germany, his baptismal name was Mark and his father, Johannes Roy or Rey, was the burgomeister, or local mayor. It is strange that none of his biographers mention his mother. Mark studied law and philosophy at Freiburg-in-Breisgau (Germany) and subsequently taught philosophy there. From 1604 to 1610 Mark became tutor to three young Swabian men who were on their travels in Italy and France. During these travels, he visited churches and hospitals, cared for the poor and would frequently attend Mass. One of these companions afterwards testified that he often practised serious asceticism during the journey. On their return, Mark took his doctorate in canon and civil law in Freiburg 1611, and for a while practised as an lawyer at Colmar in Alsace. However, he soon returned to Freiburg to join the Capuchin Franciscan Order and took the name Fidelis, meaning “faithful”. During his novitiate, he wrote a book recording the spiritual exercises he did and his own spiritual development. It was subsequently published in many languages. 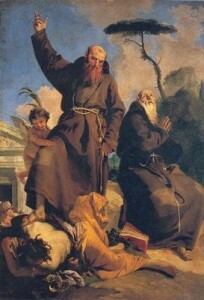 After the novitiate, Fidelis went to Constance to complete theology studies under Polish Capuchin Father John-Baptist who had a reputation for holiness and learning. He was ordained priest in 1612. From 1618 Fidelis became guardian of three houses in succession – Rheinfelden, Freiburg and Feldkirch – (1618-22) and was well-known as a preacher and for his care of the sick. In 1622 Rome set up the Congregation for the Propagation of the Faith to help spread the gospel in the newly discovered countries, and also to win back people in the Christian areas of Europe influenced by Protestantism. The Congregation appointed Fidelis as superior of a mission in the Grisons area of Switzerland around Chur where Calvinists and Zwinglians had acquired great influence. He campaigned strongly, especially by preaching, not only in the churches but also often even in the public streets. He wrote pamphlets and held conferences with the local magistrates and chief townsmen, often far into the night. Fidelis was beaten, struck down and died – the first martyr of the Congregation for Propagation of the Faith. His courage in facing death was a confirmation of all the hard choices he had been making during his life. His body was taken to Feldkirch and buried in the church of his order there, but his head and left arm were brought to the cathedral at Chur, where they remain today. He was beatified in 1729, and canonised in 1745.